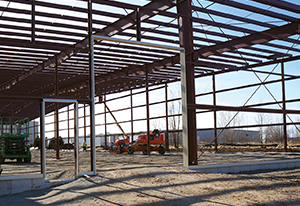 Phase one of the building expansion, to be completed May 1, 2017, encompasses a 24,000-square-foot warehouse addition. “This extra space will allow Continental to inventory more product and quickly and efficiently turnaround customer product orders,” said Floyd. Phase two, to be finished by year-end, will provide even more warehouse and office space, although exact square footage isn’t yet finalized. Along with warehouse expansions, additional offices and conference rooms will be created to accommodate Continental’s growing team. “This year, we’ll increase our labor force by 12 percent,” added Floyd. Similarly, Continental’s parent company, Girbau S.A., based in Vic, Spain, recently added approximately 100 new employees. Continental’s product offering is among the broadest in the industry, according to Floyd, with more than 90 individual models. The company serves the vended, on-premise, industrial and multi-housing, and textile care laundry markets with equipment that spans washer-extractors, continuous batch washing systems, dryers, feeders, ironers, folding systems, and related machinery. The additions will complement Continental’s current building, which serves as the company’s headquarters for marketing, sales, training, service, warehousing and customer support.